Is it warming up in your part of the world yet? It’s definitely been feeling summery here in the desert for a while now, and I was ready to bust out my cotton for some warm weather crochet. I was at Target recently (when is that statement ever NOT true? 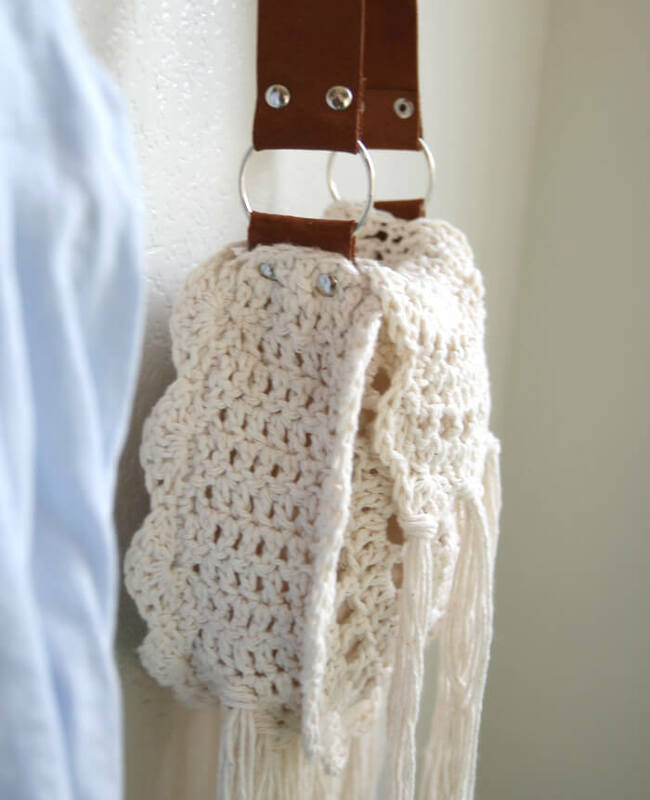 ), and I saw this cute little crocheted bag and decided to try to recreate it at home. Sure, you could totally just buy the Target bag for 30 bucks. Sure, I probably spent half that in supplies plus at least three hours making this bag. Sure, sure. But that’s not really the point, is it? The point is that I MADE this thing, and I am dang proud of that. I mean, it’s so cute, right? Leather Strip or an old belt would work great too. 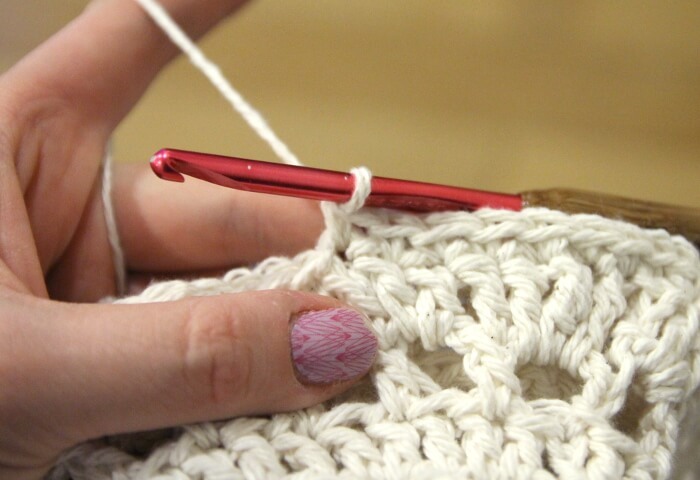 Half Treble Crochet (htrc) – Yarn over twice, insert hook into work, yarn over (four loops on hook), yarn over and draw through two loops (three loops on hook), yarn over and draw through all loops. Round 1: Starting with a magic loop, ch 2 (counts as first dc), work 11 dc in magic loop, pull to tighten, sl st to join (12 dc). Round 2: Ch 3 (counts as first dc and ch 1), dc , ch 1 in each stitch around, sl st to join (12 dc, 12 ch 1 sps). Round 3: Ch 2 (counts as first dc), 2 dc in next ch 1 sp, *dc in next dc, 2 dc in next ch 1 sp, repeat from * around, sl st to top of first ch 2 to join (36 dc). Round 4: Ch 4 (counts as first dc and ch 2), skip 1 dc, dc in next st, *ch 2, skip 1 dc, dc in next st, repeat from * around, sl st to 2nd ch of beginning ch 4 (18 dc, 18 ch 2 spaces). Round 5: Ch 2 (counts as first dc), 2 dc in ch 2 sp, *dc in next st, 2 dc in next ch 2 sp, repeat from * around sl st to first ch 2 (54 dc). Round 6: Ch 4 (counts as first dc and ch 2), skip 1 dc, dc in next st, *ch 2, skip 1 dc, dc in next st, repeat from * around sl st to 2 ch of beginning (27 dc, 27 ch 2 spaces). Round 7: Ch 3 (counts as first htrc), (trc, htrc, htrc) all in next ch 2 sp, *dc in next dc, 2 dc in next ch 2 sp, repeat from * 18 times, dc in next st, (dc, htrc) in next ch 2 sp, htrc in next st, (trc, htrc, htrc) all in next ch 2 sp, dc in next dc, 2 dc in next ch 2 sp, hdc in next st, 2 hdc in next ch 2 sp, sc in next st, 2 sc in next ch 2 sp, sc in next st, 2 hdc in next ch 2 sp, hdc in next st, 2 dc in next ch 2 sp, sl st to beginning ch 3 to join. Weave off, finish in ends. The back of the bag is worked the same as the front but with a flap added to the top. Round 7: Ch 3 (counts as first htrc), (trc, htrc, htrc) all in next ch 2 sp, *dc in next dc, 2 dc in next ch 2 sp, repeat from * 18 times, dc in next st, (dc, htrc) in next ch 2 sp, htrc in next st, (trc, htrc, htrc) all in next ch 2 sp, dc in next dc, 2 dc in next ch 2 sp, hdc in next st, 2 hdc in next ch 2 sp, sc in next st, 2 sc in next ch 2 sp, sc in next st, 2 hdc in next ch 2 sp, hdc in next st, 2 dc in next ch 2 sp, sl st to beginning ch 3 to join. Ch 2 (counts as first dc), TURN. Now the pattern will switch from rounds to rows. Row 1: Ch 2 (counts as first dc), working in back loops only, dc in each of next 16 sts (17 dc total). Turn. Row 2: Ch 2 (counts as first dc), dc in next st and each st across (17 dc). Turn. Row 3: Ch 2 (counts as first dc), dc in next st, *ch 1, dc in next st, repeat from * six times, dc in next st (10 dcs, 7 ch 1 sps). Turn. Row 4: Ch 2 (counts as first dc), dc in next st and each st across (17 dc). Turn. Row 5: Ch 2 (counts as first dc), dc in next st, *ch 1, dc in next st, repeat from * six times, dc in next st (10 dcs, 7 ch 1 sps). Turn. Row 6: Ch 2 (counts as first dc), dc in next st and each st across (17 dc). Turn. Row 7: Ch 2 (counts as first dc), dc in next st, *ch 1, dc in next st, repeat from * six times, dc in next st (10 dcs, 7 ch 1 sps). Turn. Row 8: Ch 2 (counts as first dc), dc in next st and each st across (17 dc). Turn. Row 9: Ch 2 (counts as first dc), Turn dc in next st, *ch 1, dc in next st, repeat from * six times, dc in next st (10 dcs, 7 ch 1 sps). Turn. Row 10: Ch 2 (counts as first dc), dc in next st and each st across (17 dc). Finish off, weave in ends. Row 1: Ch 8, dc in 3rd ch from hook, dc in remaining 5 chs (6 dc total). Turn. Row 2: Ch 2 (counts as first dc), dc in each of next 5 sts (6 dc total). Turn. Repeat Row 2 until the piece is long enough to wrap around the outside of the bag front – about 37 rows. To join the front of the bag to the side panel, hold the wrong sides together and work single crochets through both layers. Repeat this process by joining the back of the bag to the other side of the side panel. When the pieces are all joined together, work a shell stitch edge around the outside seam you just made. Starting in the corner of sc seam of the front of the bag, ch 1 and single crochet in the same stitch. Skip two stitches and then work 5 dc into the next stitch. Skip two stitches and single crochet in the next stitch. Repeat this pattern (sc, skip 2 sts, 5 dc, skip w sts, sc) to form shells all around the outside of the front. Work the shell stitch edge around the seam of the back of the bag as well, but continue to work the shell pattern around the flap as well. I worked three shells on each side of the flap. Your bag is all crocheted at this point! All that is left to do is add lining and straps. To make the lining of the bag, use the bag as a guide and cut pattern pieces. You will need a front and back piece (you do not need to line the flap, so they should be the same shape and size) as well as a side panel piece. I added an extra inch or so to the top of the front and back piece patterns so I could turn it under to finish that opening. I also added a pocket to one of the pieces. Pin the back or front piece to the side panel piece, and sew around the seam. Then repeat on the other side. 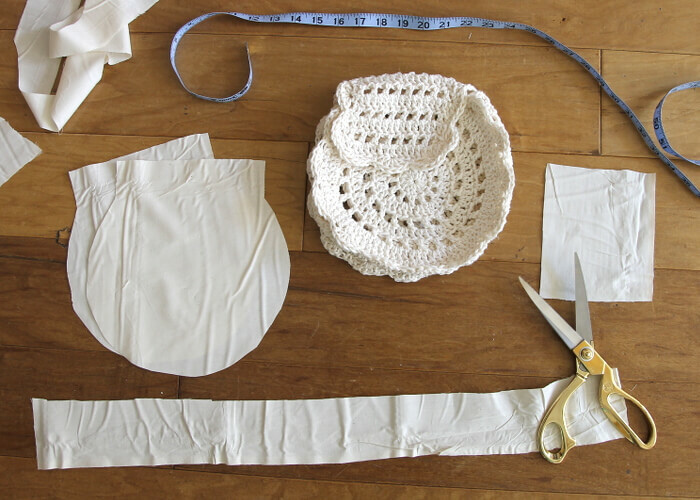 Finally, stuff the lining into your crocheted bag and hand sew the lining into the bag. When the lining is sewn in, it’s time to add the tassels! 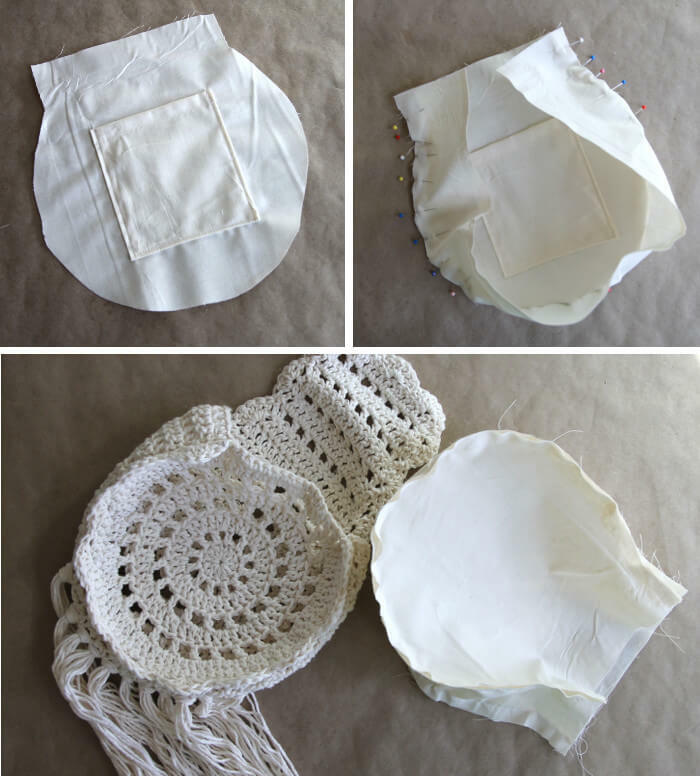 Cut five lengths of yarn, then fold them in half and use a large crochet hook to loop it around stitches along the bottom of the bag as well as the bottom of the flap. Finally, trim all of the tassels to the same length. I cut mine to 11 inches each. Last but not least, it’s time to add a strap. You could crochet a strap, but I liked the contrast of the leather, and it was a good opportunity to work with a material I don’t use all that often. 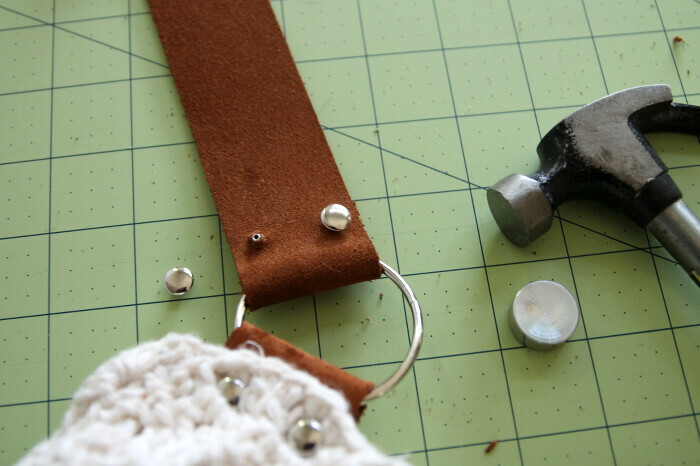 I started by cutting small pieces about an inch and a half long that I looped around the steel ring and attached to the bag using rivets. To set the rivets, first punch a hole the right diameter for your rivets through the leather, then push the rivet through all layers, push the end on with your fingers, and then set the rivet with the setter and a hammer. I repeated the process to join the strap to the rings. And that’s it! My fun new summery bag was all done! If you have any questions, please leave them in the comments and I will be happy to try to help. If you make your own bag, I would love to see it! Please share it to my facebook page or tag me on instagram. 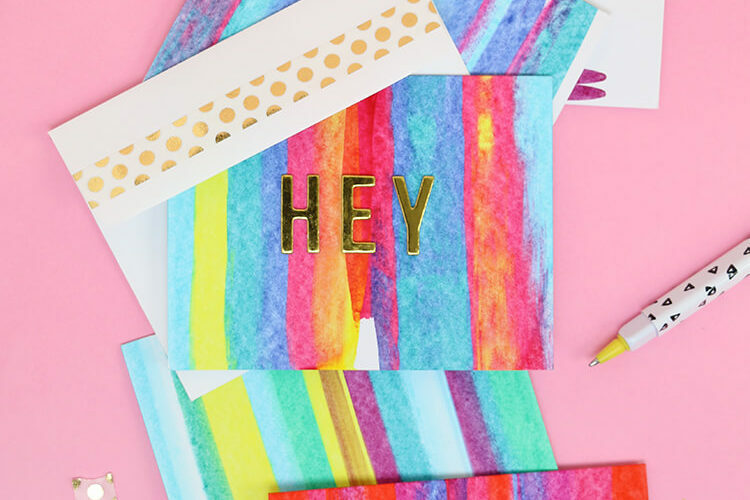 I looked at it, loved it and want to make it! Thanks you sooo much! I totally agree! And thanks so much! Hello! I’m sorry I should have had the instructions for that stitch in the pattern. I’ve just added them now. 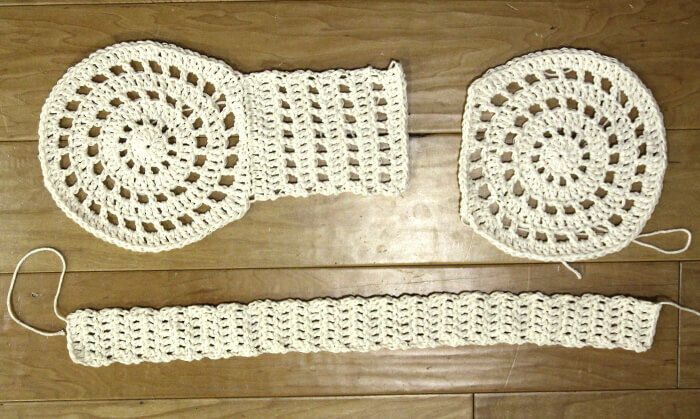 Htrc is half treble crochet, which is between a double crochet and treble crochet in height. To work the htrc, yarn over twice, insert hook into work, yarn over (four loops on hook), yarn over and draw through two loops (three loops on hook), yarn over and draw through all loops. Hope that helps! I love this little bag! I am going to try to do it – thanks for sharing. 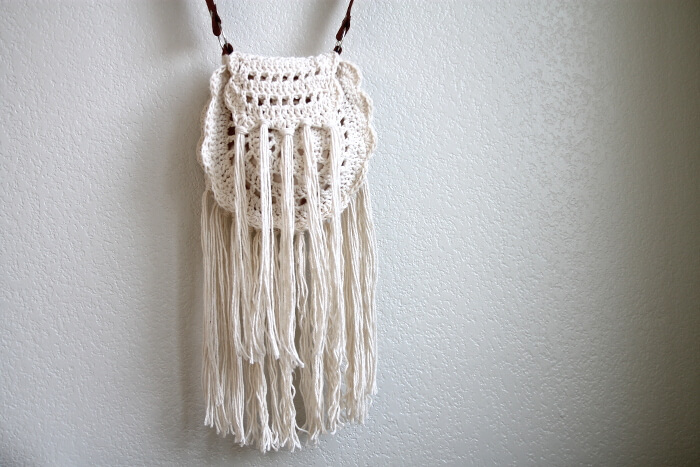 I love this boho bag! Thanks for sharing how you made it. I really like those tassels! I pinned it! Wowza, that is gorgeous. Nice work! Thank you!! Can’t wait to see it! So super cute! 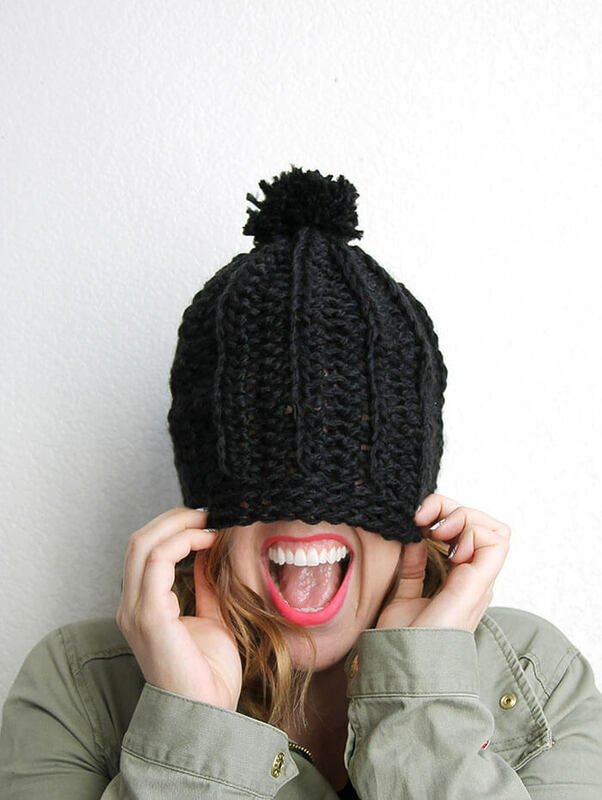 You are seriously a crochet genius. Love how boho chic this is! 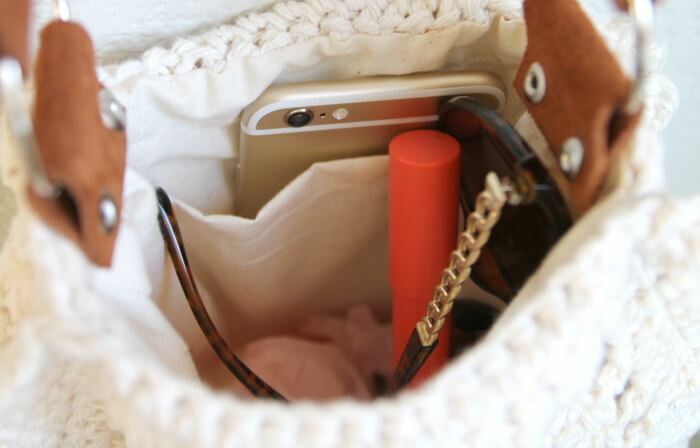 Would be perfect for carrying around only the necessities at summer festivals! This is so lovely! It is my new favorite crochet pattern. I can’t wait to make it! What a way to find your site! Luckily I have almost everything I need to make this gorgeous bag. Rejoice you have a new follower. Love this! 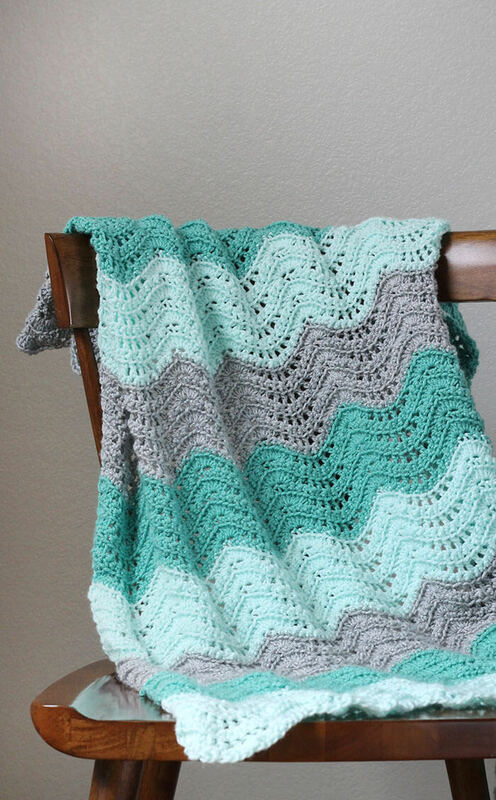 Makes me want to push past my VERY basic blanket crocheting skills and learn how to read patterns! This bag is awesome, thx so much for the pics and the detailed explanation! This is the ultimate cool bag for any age person to carry! Found her site from fb. loved the bag so much I started on it right away. Can you help me with r7. what is a htrc? thanks so much for your help! I will pin when I am done. Hi Kathy! HTRC is a half treble crochet. It looks like maybe I got the abbreviation wrong and I should have written it as “htr.” You wrap the yarn around the hook twice before drawing up a new loop, then YO, and draw through the first two loops. YO again, and draw through the remaining three loops on the hook. It is in between a dc and a tr stitch in height. I will be sure to add this info to the pattern. Thank you! Steven, I don’t see a reply to your question and i encountered the same situation. The pattern should read to dc, ch 1, skip next stitch, repeat across…just like we did in the body of the purse. i am a beginner so this may be a ‘duh’ question, but… how many chains should the magic loop be to begin with? Hola Me encanta el trabajo de este bolso. Pero la traducción al español es algo confusa. Las hilaturas que quiere decir? Y el punto alto retorcido como se hace? I love this bag! I tried it out and just wrote a blog post about it – I’d love it if you checked it out! Awesome! I will definitely check it out! Thanks! Hi Desiree! I’m sorry I should add explanations of the abbreviations to the instructions. Trc is American treble crochet, which is worked like a double crochet, except you wrap the yarn around the hook twice before beginning instead of just once. Htrc is half treble crochet. You begin like a treble crochet, but instead of working all the loops off two and at a time, you work two off and then the remaining three all together. It is in between a double and treble crochet in height. I hope that helps! I would love to see your bag when you are done! This is wonderful. I saw it on Pinterest, stopped making dinner, ran to the yarn closet, grabbed my Sugar N Cream and went to work. Then got stuck on Round 4. I cannot get 18 DC by skipping two DC, so I just skipped 1. Is this a mis-print or typo or am I going nuts? I’m with Chantel on this one – Round 4 should be chain 2, skip 1 or else you’re going to wind up with only twelve ch2 spaces. 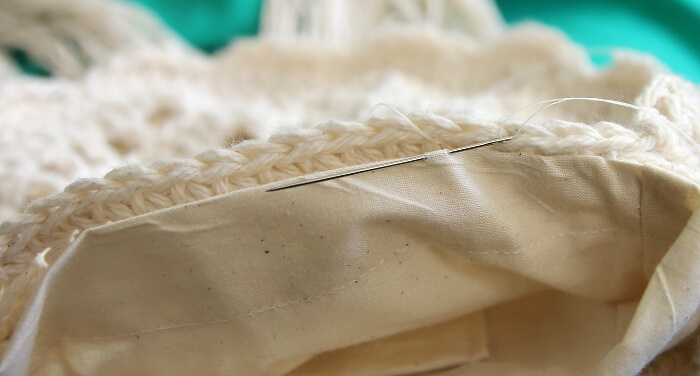 Skipping one stitch will give you the right number of spaces. Hi! I love this pattern and bag! I am having trouble making the pattern for the lining. Is there any way to make it easier or could you post the pattern you made on here? Thanks, Taylor! It is on my list to get some videos going soon. I will try to get one up. Thanks again! I think there might be some mistakes in the back section in the back and fourth rows, particularly 3 and 4 the pattern does not match the picture. Thanks, Shaylynn. I will try too look at it and see what the problem may be. Thank you, Shaylynn! I will look at it and see if I can figure out what the problem may be. Hi thank you so so so much for sharing this pattern, I love the style of boho, and I really needed a new bag so this was perfect! 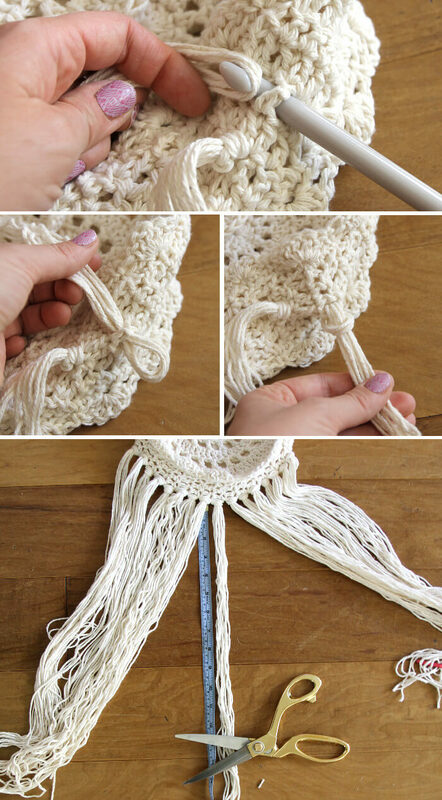 Thanks, I’m 13 years old, don’t have to much experience with crocheting, but I understood this very easily, thanks again! Thank so much for your comment, Katie! I am so glad you found the pattern helpful! I love that you are crocheting at 13! Good luck! I loved this bag in Target, too! I was hoping to catch it on clearance…now I don’t have too! Thanks so much! I can’t wait to go get the yarn! So nice thanks for all the instructions. Very generous to share. Thank you for making a written pattern, you made things a little easier for me.Now there is a 20% off the bag at Targets, but I prefer my version. Sort of hippy looking. I updated the pattern. Thank you for catching that! I love soooooooo Muuuuuuuuch !!! So cool! it’s beautiful and I’ll try to do this! Thank you for pattern! Does the ends of the fringe fray with use?? Or do you treat them with something so they don’t fray???? Hi! I am having an issue and I have no idea how it happened! 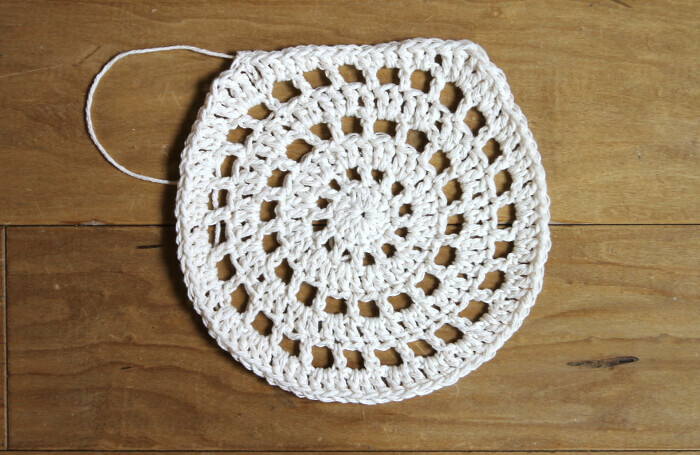 When I did row 7 I only ended up halfway around my circle with only 2 corners. Should I mirror row 7 to get all the way around? Hi Shelby! Hmm… I’m not sure on that… I would reference the photo to see if that helps. There should only be two corners, but they should both be kind of at the top. Make sure you did enough repeats of the “dc in dc, 2 dc in ch 2 sp” repeats. Sometimes it is helpful for me to just frog that round and start over. Good luck! This step could be clearer. There are also still errors in written pattern. A beautiful bag once finished but took WAAY to long to figure out why it wouldn’t work as per your pattern. This pattern is still relevant today…..maybe its time to correct it or perhaps a video tutorial?? Shelby the same thing happened to me as i only repeated 18 dc stitches……you have to repeat the ” dc in next dc, 2 dc in next ch 2 sp” group 18 times, it then works. 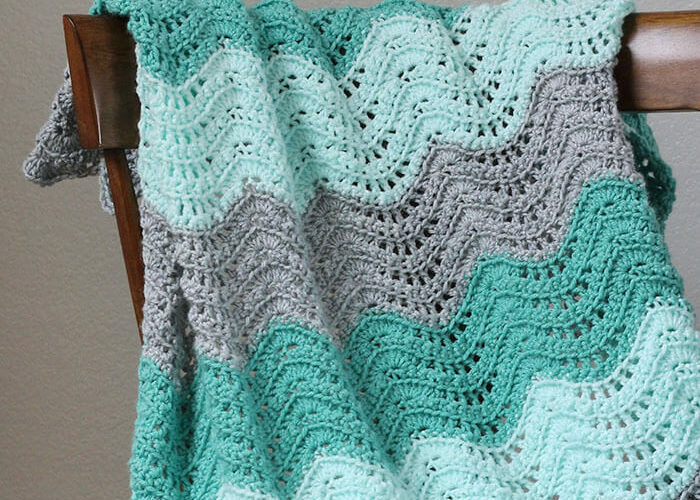 Love this pattern and Im making one for my daughter in law right now. Thanks for sharing! 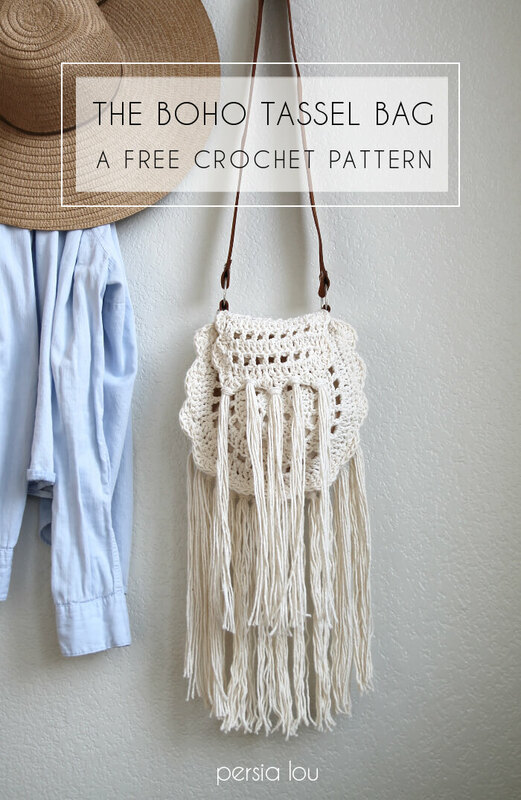 I totally Love this handbag, I will be making this when I’m done with all the Christmas gifts and charity projects… I love crocheting and creating Beautiful things… Thanks so much and Blessings to you! Thanks for sharing this wonderful bag. Will be on my project list. Hello. Love this and working on it as a Christmas gift. Can you tell me if row 2-9 on the back of the bag rows are all in the back loop only or just the first row? Hi Autumn! Just the first row of the flap should be worked in the back loops. 🙂 Good luck! Can you give me a bit more information about the problem you are having? Hello! Love this bag. If I were to make some would I be able to sell them on Etsy? Thank you Alexis sooooo much!!! I’m making it right now, literally. I’m working on the shells and already in love with it! love this bag. i am not sure what i am doing wrong. after round 2 it starts looking like a bowl, like when you are making a hat. i have gone up 2 hook sizes. i know i crochet tight , so i will keep playing around with it. Are you possibly leaving out a stitch or not doing enough repeats? 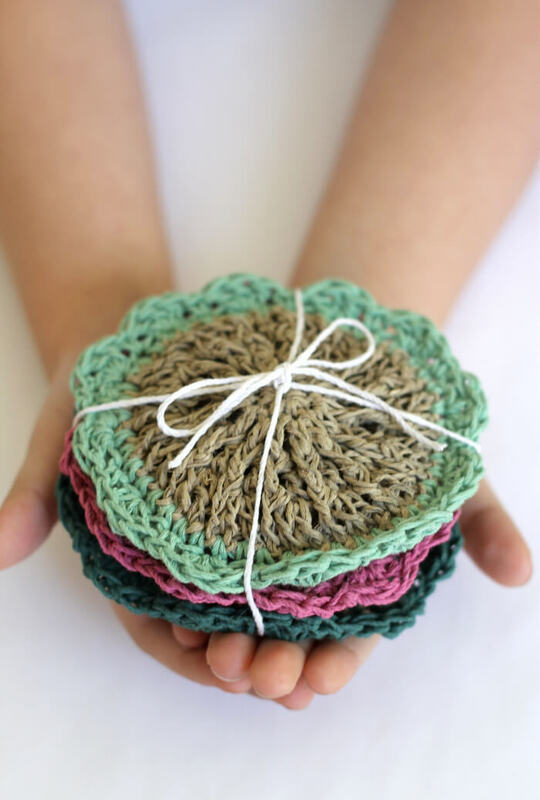 Usually when it starts turning bowl-shaped there aren’t enough stitches… Good luck! You don’t really chain into the stitch. In row 3 (of the flap?) you just work a chain before you do the dc stitch. It creates a little gap in the work. I hope that helps! How did you put a lining in the purse? Hi Amber! I just used the bag itself to help me make a pattern for the lining, and then hand sewed it into the bag. Could someone explain round 5? I just started a few weeks ago and I not really sure what * means. Hi Ashley! Later in the instructions it says repeat from * x number of times. So you repeat the stitches after the * and before “repeat” however many times it says. I hope that helps. Good luck! Thank you so much for replying now I understand and by the way I love the black cat slouch hat. All your projects are so cute I hope you gain more subscribers in YouTube. And again thank you. 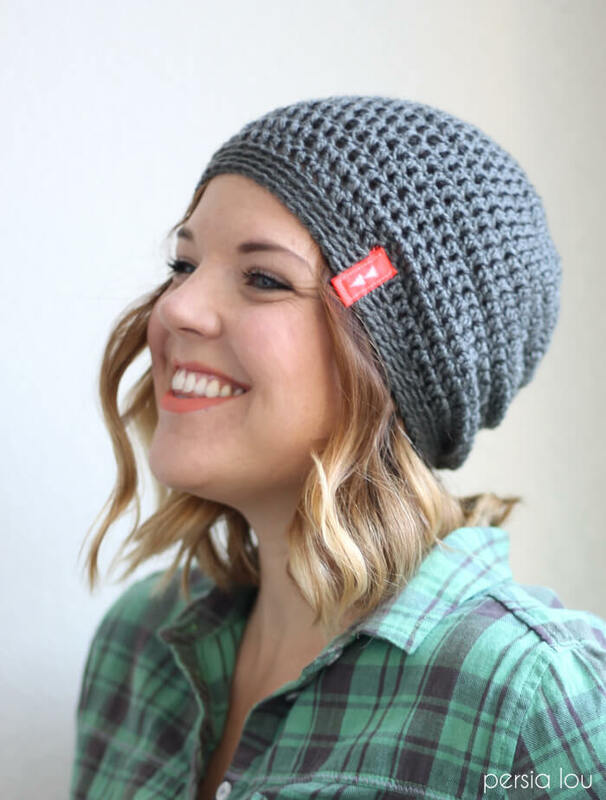 Am I allowed to sell a finished item as long as I give full credit for the pattern to you? 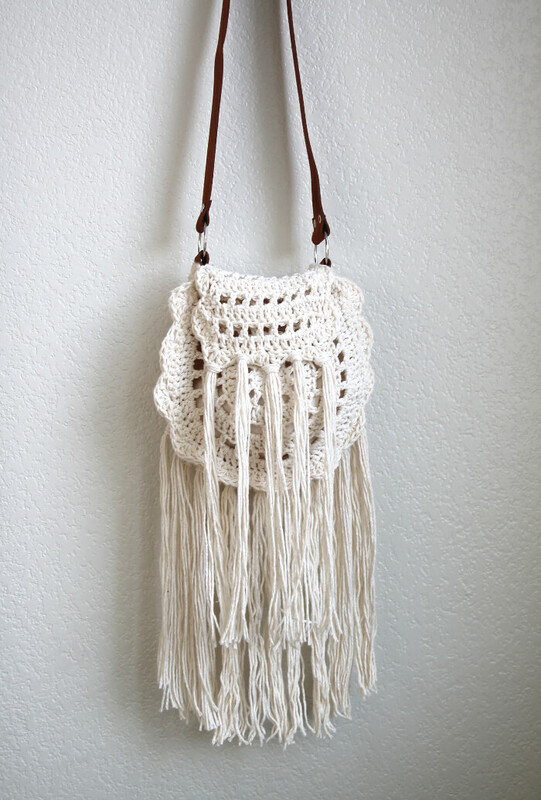 I am working on the boho tassel bag for myself but I have a few friends that have been asking me about making it for them and I do not want to sell something I made from a patten that is not my own without permission. Crocheting the purse and love it! What stitch would you suggest for the strap? 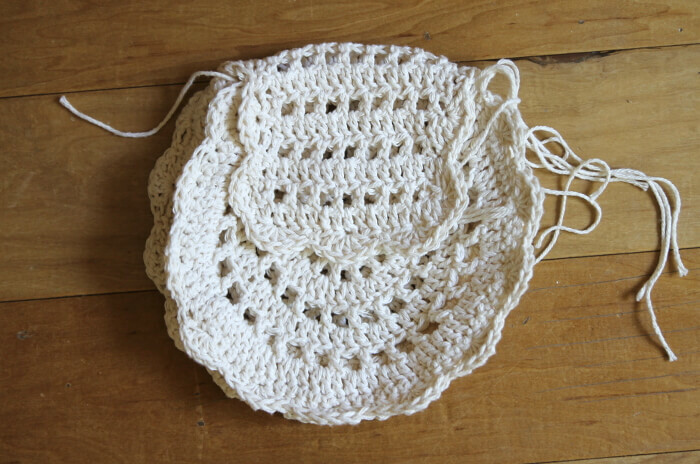 I would probably do a double crochet – I’m thinking about three long rows. It might be cute to add the scalloped edging to it too. 🙂 I would love to see it when you are finished! I was going to continue the sides all the way up and adding the scallop. Don’t know if it would be too wide. I will send you a pic. Ummm how do I do that? I finished the cat hat too. Would love to show you. Nevermind, I will send pics to your facebook page. Thank you so much! I’m so glad you liked the pattern! If you use facebook, instagram, or twitter, you can share your photo with me there. (Facebook – https://www.facebook.com/persialou Instagram – https://instagram.com/persialou Twitter – https://twitter.com/persialou – Tag me (@persialou) and use the hashtag #persialou ) OR you can email me at [email protected] 🙂 Have a great day! I love this bag but want to make mine bigger. How do I go about doing that? do I increase the rows I crochet? Hi Tyree. 🙂 To make a bigger back, Repeat a few more rounds on the front and back pieces making sure to increase the stitches as you go (this keeps the piece from curling in on itself). Then you will need to make the side panel longer so that it’s the same length as the outside of you finished front and back pieces. Good luck! I would love to see it when you finish. Thank you for responding to my question last time, but I’ve ran into some trouble and I need some help. I finally finished the front with 121 stitches and 60 spaces and the last part on the insturctions is when I have to do the treble crochets. I did the repetitive part 40 times and tried to finish the rest, but I still have a lot of chains left. Do I slip stitch my way around the project or repeat the rest of the pattern after it says 18 times? I absolutely LOVE this! You did such an amazing job. I can’t wait to make one of my own! I browsed through this and plan to make it, so I am not positive, but this seems like a very detailed and easy to follow tutorial. Thank you so much for taking time to make and share this. I’d be happy to share pictures with you once I’m finished if you let me know an email or site to share them on. Once again thank you, this is so pretty! Hi Stephanie! I would absolutely love to see your bag when you finish! If you are on instagram or facebook, that’s an easy way to share with me. Just tag me in your photo on instagram (@persialou) or you can share it to my facebook page (https://www.facebook.com/persialou) or you can email me a photo too at [email protected] 🙂 Hope you like the bag! How many sugar n lily yarn did you use? It’s almost 2017 and this boho bag is still just amazing!! I haven’t made it yet but as soon as I get all my Christmas crocheting done it is NEXT no matter the request I get, lol. Thank you so much for your time making this pattern and the pictures…also I very much appreciate you updating it as people brought attention to “tiffs” in the pattern. So many times I’ll crochet a pattern of the internet and some part won’t work out, then I’ll go through the comments and it’s been addressed but the pattern doesn’t reflect it. So again thank you for all you do!! God bless you and have a Merry Christmas!! Hola lo siento, Cynthia. Tal vez intentar un traductor? Lo siento pero no tengo una versión en español disponible ahora mismo. Hello! I just used rivets to attach the straps to the bag. If you look at the last photo of things inside the bag, you can see that I did not put them in between the lining and the crocheted portion of the bag (although that is a great idea! I just folded that loop of leather over, and hammered the rivets through the leather and the bag. It has worked well. Good luck!! hi persia! 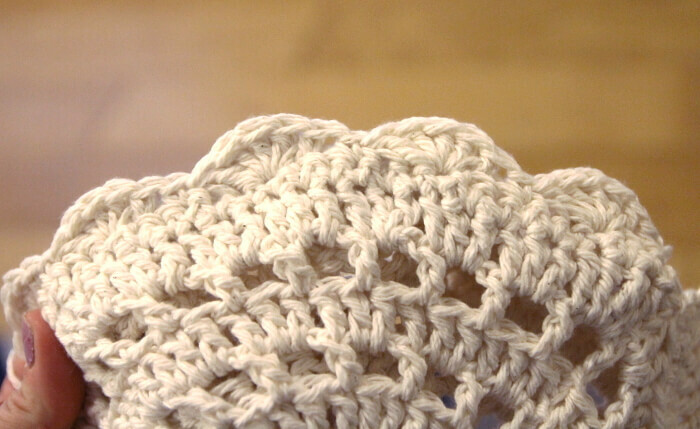 do you ever have an issue with the rivets coming right through the crochet? i love all your stuff by the way, thanks in advance!!! oops! i meant “hi alexis”!!! Hi Michele! Thanks so much! 🙂 I haven’t had that problem, but I can definitely see how it could happen. I think lining the bag definitely helps, and also try to put the rivet through a stitch instead of in between stitches. 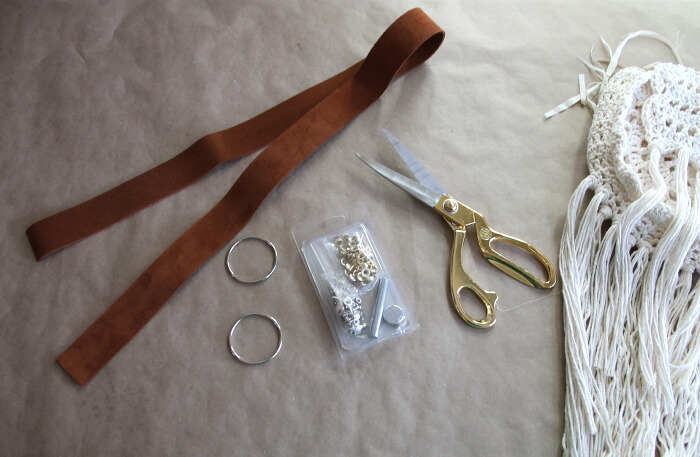 Another option would be to sew the leather directly to the bag, just make sure to use a heavy duty needle and thread. Hope that helps! Hi! I’m currently making this bag for my friend who is DYING to get her hands on the finished product, but I’m confused with Row 5….do I do exactly what was done in Row 3 (2 dc in one ch and then one dc in the next ch)? I did that for Row 5 and I have way too many dcs for this row. Thanks for your help and this amazing pattern! Where did you get your material for your strap? I have my whole bag done and ready to sew but stuck on my strap. Went to Joann but they didn’t have anything to use. Hi Amber! I believe I picked it up at Hobby Lobby, but you can get it through Amazon here: http://amzn.to/2mGojSZ (that’s an affiliate link). I think the price was a bit better at Hobby Lobby. You could also absolutely us a thrifted or old belt. Good luck! Oh thank you so much! I will check out Hobby Lobby! That was going to be my next stop! 🙂 I am so excited to get this finished! Hi!! I LOVE this bag!! I am creating it as we speak. 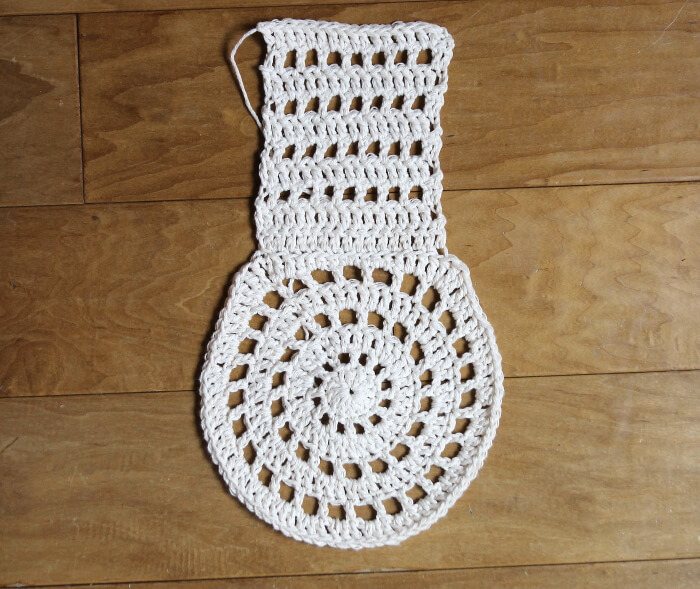 However, I am just going to crochet a strap to save the time and money of going to the store. Any recommendations on how to do this? Where to attach it? How wide to make it? Thank you so much!! Hi Jessi! 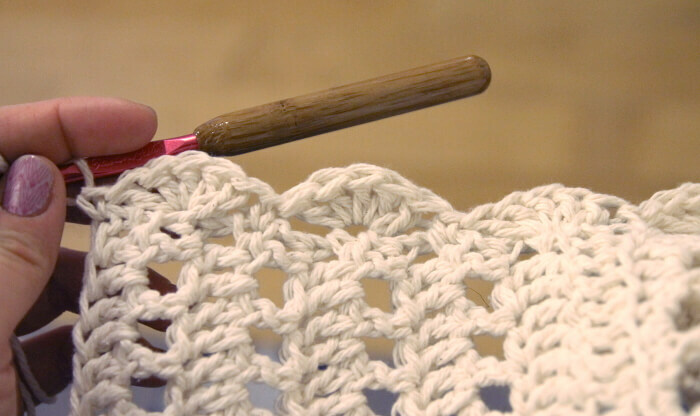 I would probably do just do a short row of double crochet stitches – maybe like 5-6? I would think I would want the strap about 1.5″ wide. Hope that helps! Alexis, I am crazy for this bag. Just too sassy! I made the front, but I think it is too large even though I went down a hook size. Can you give me a measurement of the overall width, maybe before scalloped edging? I may need to go down to a G hook. I so love this bag and want to make many in lots of fun colors. Thanks again for sharing your creativity. Not sure what ‘your comment is awaiting moderation’ means. Do i have to do something more to send this message to you? I am having trouble with round 2. Pattern says dc chain 1 but when I do this it turns out like a bowl. If I do dc chain 2 it lays flat. what else could i be doing wrong or is the pattern incorrect? Thank Goodness for genius creative people like you. This is adorable! I want to make it for one of my granddaughters. I don’t sew, so the lining will be a challenge for me; and, I’ll have to crochet straps. Thank you, thank you, thank you!!!!!!! I love this pattern, but I cannot print past the first page. Any tips?